How to run a politically-charged campaign. Many brands shy away from divisive topics when it comes to advertising and social media campaigns. 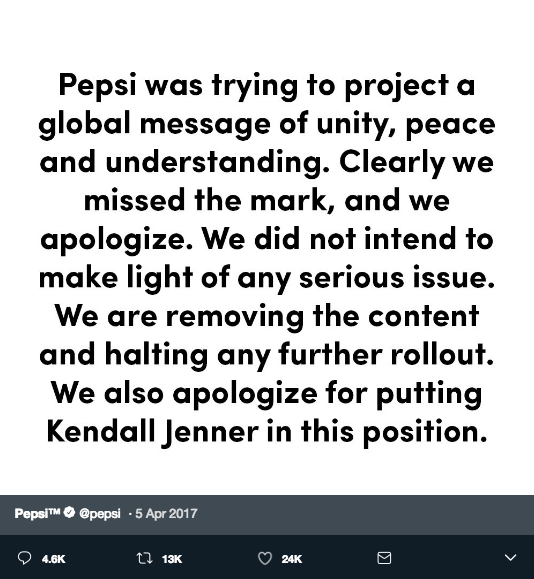 It would seem the backlash of such classically misguided campaigns as Pepsi’s Kendall Jenner ad or Starbucks ‘race together’ campaign continues to discourage brands from having a voice on political issues. However, according to new research by Sprout Social, this needn’t be the case. They found that two-thirds of consumers (66%) believe it’s important for brands to take a stand on political issues – albeit in a much more intelligent and aware way than Pepsi or Starbucks did. 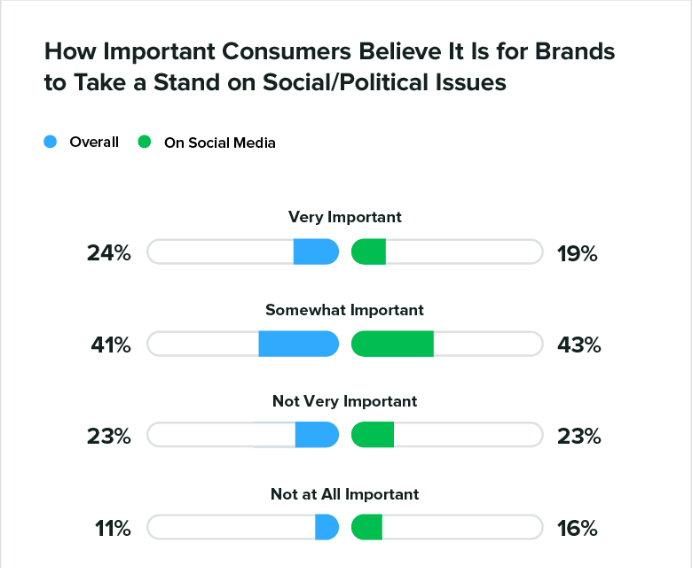 Sprout found consumers want brands to weigh in on topics such as immigration, human rights and race relations and it also appears that social media is the place where consumers are most receptive. I know what you’re thinking – even though costumers want brands to take a stand, how do you successfully face up to thorny issues and is the potential reward worth the potential risk. There have been a number of extremely successful politically-minded campaigns that not only earn consumer favour and cultivate a loyal following – but generate business too. From toy manufacturer Goldiblox’s ‘Girls’ campaign which turned Beastie Boys’ famously misogynistic song ‘Girls’ into an anthem for female empowerment to ridesharing app Lyft who pledged $1,000,000 to UCLA when Uber decided not to join a taxi strike to run to airports following Trump’s travel ban. More recently, Paddy Power ran a World Cup campaign that is an incredible example of how successful a creative and well thought-out political ad campaign can be. 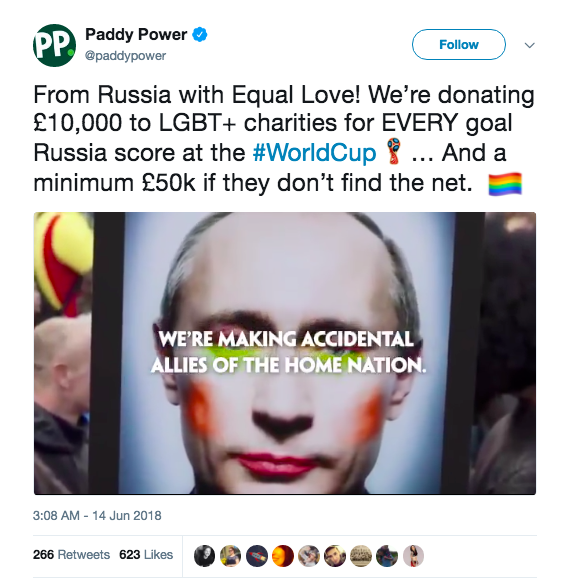 The idea seems simple – donate £10,000 to LGBTQ+ charities for every goal Russia scored at the World Cup. Relevance for a campaign such as this is paramount. The World Cup is clearly one of the biggest world events, viewed by a huge audience resulting in an incredible boost in advertising spend ($2.4 billion in 2018). 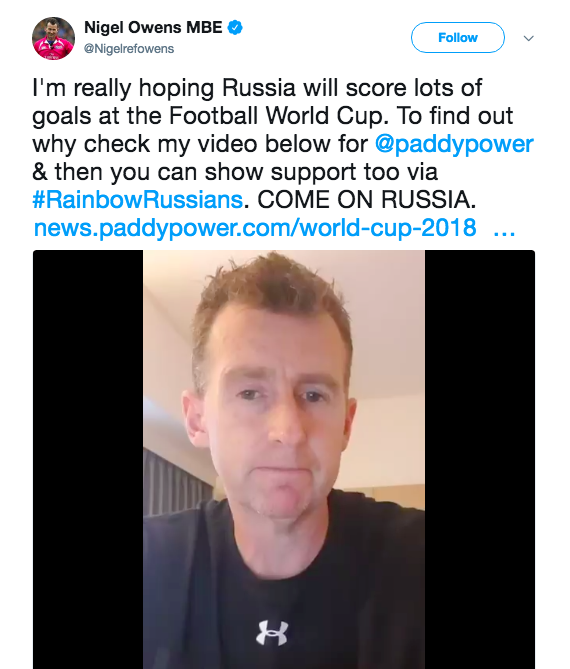 Rather than simply jump on a footballing theme, Paddy Power cut the pressing issue that surrounded this year’s World Cup in particular. In recent years FIFA has been heavily criticised as an organisation. The naming of Russia as 2018’s host nation and Qatar as the host of 2022 was massively controversial and disheartening to many football fans who felt conflicted about supporting nation’s with homophobic values. By focusing on a subject that so many organisations would shy away from their campaign certainly stands out amidst the noise of World Cup advertising. The overall message turned boycotting into supporting. Rather than not tune in, it gave everyone who doesn’t agree with Russia’s oppressive policies a way to actively support the host nation and allow them another reason to get behind the whole World Cup in general. This positive message is what people want to see organisations do, especially on social media. It’s something that perhaps celebrities will be happy to back as well. When corporate giant Starbucks attempted to encourage people to discuss racial equality over a coffee their message was,“buy our product and spend a few minutes discussing an incredibly important and complex social issue” whilst also overlooking its own inadequately diverse workforce. To make a political stand as an organisation, simply raising the issue isn’t usually good enough. Actioning these beliefs are what’s important. 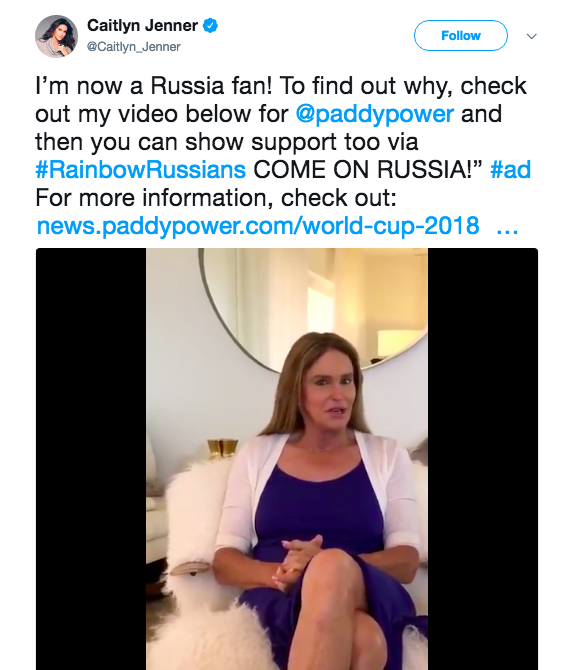 Paddy Power’s campaign pledged a minimum of £50,000 to LGBTQ+ charities that offer opportunities for equality in sport in Russia – making a direct impact on the issue at hand. Having scored eleven goals at the finals this year £110,000 will go towards making sport more inclusive to the LGTBQ+ community. Even though football didn’t come home, thanks to Paddy Power there’s something positive we can take from this year’s World Cup. If you’re interested in how social media campaigns can positively affect your business, get in touch.